Marvin Darnell Harrison (born August 25, 1972) is a former American football wide receiver in the National Football League (NFL). He played college football for Syracuse University, and was drafted by the Indianapolis Colts in the first round of the 1996 NFL Draft. He spent all 13 of his NFL seasons with the Colts, most of them with quarterback Peyton Manning, and is widely considered as one of the greatest and most productive wide receivers in NFL history. He earned a Super Bowl ring with the team in Super Bowl XLI over the Chicago Bears. Harrison was a Pro Football Hall of Fame finalist for the Classes of 2014 and 2015 before being elected in 2016, the same year his former coach Tony Dungy was voted into the Hall. Harrison attended Syracuse University, where he was a three-year starter for the Syracuse Orange football team, playing with quarterback Donovan McNabb in his final year. Harrison set a school record with 2,718 career receiving yards and ranked second in school history with 20 receiving touchdowns to Rob Moore. Harrison graduated with a degree in Retail Management. Harrison was selected by the Indianapolis Colts with the 19th selection in the 1996 NFL Draft, a selection which was obtained in a trade that sent Jeff George to the Atlanta Falcons. Harrison went on to become one of the most productive receivers from that draft class, which included Keyshawn Johnson, Eric Moulds, Bobby Engram, Muhsin Muhammad, Eddie Kennison, Terry Glenn, Amani Toomer, Joe Horn, and Terrell Owens among others. In 2002, Harrison broke Herman Moore's single season receptions record by 20 receptions. He finished with 143 catches, and he also had 1,722 yards receiving. In December 2006, Harrison became just the fourth player in NFL history to record 1000 receptions, joining Jerry Rice (1549), Cris Carter (1101), and Tim Brown (1094). He is also one of only seven wide receivers in NFL history to reach 100 touchdowns. In 2005, Harrison had five 100+ yard receiving games in a seven game stretch late in the season. During Week 15, he passed Isaac Bruce to become 10th in all-time career receiving yards, and also the leader among active players. He maintained this title for exactly two seasons, until Bruce retook the lead in Week 15 of 2007. Harrison had injured his knee against the Denver Broncos while attempting a block and was lost for the season, making only a small appearance in their lone playoff game that season. It marked only the second time Harrison had missed regular season action due to injuries and the first since 1998. On December 14, 2008, in a game against the Detroit Lions, Harrison caught his 1,095th career reception, passing Tim Brown for third all time. He passed Cris Carter to become second on the all-time NFL reception record list with 1,102 receptions during a 23–0 Colts victory over the Tennessee Titans on December 28, 2008. Following the 2008 NFL season, Harrison asked for and was granted his release by the Colts. After sitting out the entire 2009 season, Harrison quietly retired from the NFL. Harrison was inducted into the Indianapolis Colts Ring of Honor during the week 12 game against the Carolina Panthers on November 27, 2011. Harrison is a member of the Pro Football Hall of Fame. Marvin Harrison and Peyton Manning currently hold the NFL record for most completions between a Wide Receiver and Quarterback with 953. Marvin Harrison and Peyton Manning currently hold the NFL record for passing touchdowns between a WR and QB with 112. Marvin Harrison and Peyton Manning currently hold the NFL record for passing yards between a WR and QB with 12,756. Marvin Harrison and Peyton Manning currently hold the NFL record for completions in a season between a WR and QB with 143 in 2002. First player to record 2 seasons of 1,600 yards receiving in NFL history, (1999 & 2002). (Torry Holt became the 2nd, (2000 & 2003), Antonio Brown became the 3rd (2014 & 2015)). On December 18, 2006, Marvin Harrison and Indianapolis Colt teammate Reggie Wayne became the only NFL wide receiver tandem to catch 75 receptions and 1,000 yards in 3 straight seasons. The game was on Monday Night and was played against the Cincinnati Bengals. On December 28, 2008, made his 1,100th career reception against the Tennessee Titans in his last regular season game and his last game in Indianapolis. He is the fastest player to do so reaching the mark in 190 career games. Harrison was sued in a civil lawsuit by Dwight Dixon, a convicted drug dealer, after both were shot outside Chuckie's Garage, a North Philadelphia business owned by Harrison, on April 29, 2008. The two men had been in a fight minutes prior to the shooting over an issue that happened a few weeks earlier, when Dixon and Harrison got into a verbal argument when Harrison denied Dixon entry into Playmakers, a sports bar owned and operated by Harrison. Dixon alleged that Harrison was the gunman who shot at him. On January 6, 2009, Philadelphia District Attorney Lynne Abraham confirmed that the gun used was the same model as Harrison's gun that fired shots at Dixon but they had been unable to determine who pulled the trigger. The Philadelphia District Attorney also stated that she was not going to pursue charges in this case due to conflicting witness statements. In fact, within a week of the first shooting, Marvin Harrison was not considered a suspect. Dixon, who had initially given the police a false name and claimed he was robbed by two men when interviewed at the hospital, was subsequently convicted of filing a false report for this incident on January 28, 2009. Dixon was sentenced to 6 months probation. Dixon's attorney reportedly sought a new trial as the conviction violated Dixon's parole in an unrelated case. Harrison is also being sued by Robert Nixon, a victim caught in the crossfire of the shooting who identified Harrison as the shooter in a statement to police. Dixon died on July 21, 2009, after he was shot several times while in his car outside a building two blocks away from Harrison's sports bar. At the hospital after the shooting, detectives questioned Dixon before surgery and he stated that it stemmed from the Harrison incident a year prior and that Harrison had hired a gun man to shoot him. An informant also made a statement asserting the gunman that killed Dixon was Lonnie Harrison, Marvin Harrison's cousin. On June 16, 2010, Shaun Assael of ESPN The Magazine reported that police confiscated a 9mm handgun from Harrison during a routine traffic stop on Wednesday in Philadelphia. Police will test the gun to see if it matches three spent 9mm shell casings that ended up inside the truck driven by Dwight Dixon at the scene of an April 2008 shooting. Dixon, who eventually was shot and killed after filing a civil lawsuit, claimed that the casings came from a second gun that Harrison fired. Authorities already have matched other bullets to a separate gun that Harrison owns—and that he stated was in his home on the day the shooting occurred. Police found the gun during a search of Harrison's Escalade. The stop occurred as Harrison drove the vehicle the wrong way on a one-way street. Harrison claimed he did not have a gun. But police believed they saw Harrison put what appeared to be a weapon in the console between the two front seats. They concluded that they had probable cause to search the vehicle, and they found the gun. Harrison was not charged. Another incident occurred in 2014, when Harrison narrowly escaped a Philadelphia shooting. ^ "Start with Rice No. 1, Moss No. 2 in best WR debate - NFL - ESPN". Sports.espn.go.com. March 26, 2008. Retrieved August 17, 2014. ^ "Pro Football Hall of Fame finalists revealed - NFL - ESPN". Sports.espn.go.com. January 9, 2014. Retrieved August 17, 2014. ^ "Marvin Harrison: Official Website of the Indianapolis Colts". Colts.com. Archived from the original on May 18, 2008. ^ "Indianapolis Colts end 13-year relationship, release wide receiver Marvin Harrison - ESPN". Sports.espn.go.com. February 24, 2009. Retrieved August 17, 2014. ^ MJD. "Peter King Twitters that Marvin Harrison is done - Shutdown Corner - NFL Blog - Yahoo! Sports". Sports.yahoo.com. Retrieved August 17, 2014. ^ "This site will soon be up and running". Indiana.sbnation.com. Retrieved August 17, 2014. ^ Legwold, Jeff (February 7, 2016). "Brett Favre, Ken Stabler, Marvin Harrison among Hall's 2016 class". ESPN. Retrieved February 7, 2016. ^ Holder, Stephen (February 7, 2016). "Marvin Harrison's work ethic rewarded". Indianapolis Star. Retrieved February 8, 2016. ^ "Civil Docket". Fjdefile.phila.gov. Retrieved August 17, 2014. ^ Alesia, Mark. "Police: 'Harrison not suspect at this point'". Indianapolis Star. Retrieved September 28, 2014. ^ "Man shot by Indianapolis Colts receiver Marvin Harrison's gun set for trial". ESPN. January 27, 2009. Retrieved August 17, 2014. 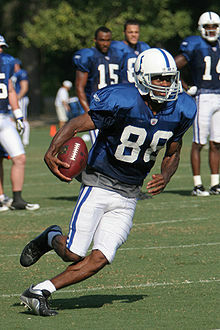 ^ "Second man claims ex-Indianapolis Colts WR Marvin Harrison shot him". ESPN. July 27, 2009. Retrieved August 17, 2014. ^ "Sources: FBI joins probe of Marvin Harrison gun case". ESPN. January 15, 2010. Retrieved August 17, 2014. ^ "Marvin Harrison Narrowly Avoids Gunfire in Philadelphia". philly.com. Retrieved December 17, 2014.